Choosing furniture for your university – whether a new-build or updating existing – goes way beyond practicalities such as cost. Today, you need to consider not only shifting trends in terms of design and aesthetics but also in the student and staff experience. Does it fit with your sustainability strategy? What is the environmental impact and does it have longevity? How will it enhance student – and teacher – wellbeing? How will it enable good learning practices? These are just some of the now common questions your choice in furniture and fixtures will need to take into account. From adaptable tables and seating to engender collaborative learning to engaging students by ‘placemaking’ – creating a sense of place or ownership – today, the university environs have to deliver a lot. There has been a shift from traditional-style teaching to a ‘flipped learning model’ and your choice of furniture and fixtures can work hard to enable this. This is where adaptable furniture comes into play with seating and desks moveable to enable students to switch easily between individual and collaborative working. And it doesn’t stop there – every facet of design from the ground up plays its part to ensure lecturers and students alike – together with key stakeholders – get the maximum versatility from a space, whether that’s shared learning, a break-out area or somewhere to grab a coffee. Versatility is especially important, helping to develop a sense of ownership for students. And it is this sense of ownership, together with meeting the needs of students and teachers, that now needs to dovetail neatly into any new fit-out strategy. When choosing furniture for the university’s STEM building, the university adopted a consultative approach, setting up a user group comprising key stakeholders. Dr Maria Simon explains: “Stakeholders from across the University of Bedfordshire have been involved in choosing the furniture for the new STEM building through a dedicated user group, made up of staff, students, project managers and architects. A sample area was also set up to allow all students and staff to try out some of the furniture and give feedback. “Having recently completed a new library, the project board had a good steer on what worked well, what is durable and what students and staff like. Specialist knowledge of staff, along with consultation with external stakeholders, has enabled us to make informed decisions for the new building. 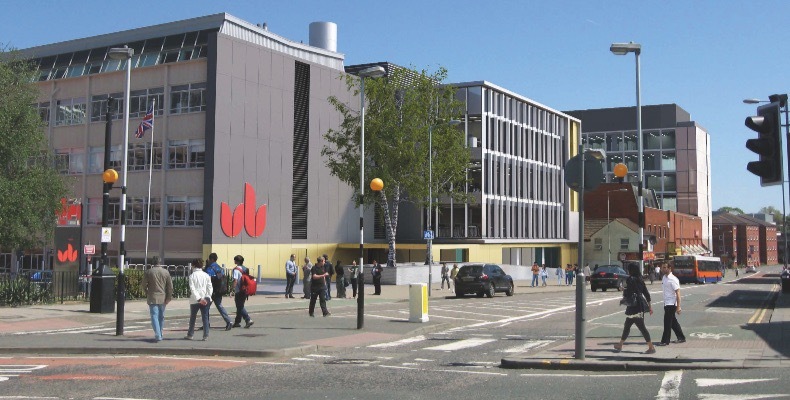 Dr Simon says: “In addition to considering how to reduce its carbon footprint as part of the build – eg with lighting sensors, carefully managing air changes, even in laboratories and environmental control – the University of Bedfordshire has taken into consideration where more can be done, such as using variable air volume fume hoods. We’ve seen a real shift in the approach towards designing learning spaces recently. Gone are the days of dark, cramped libraries where students work quietly in isolation. Universities and colleges are now hubs of creativity, with vibrant spaces which are both engaging and inspiring. One key trend architects and designers are adopting more and more is biophilic design, and when you consider the benefits of incorporating natural or nature-inspired elements into an education environment, it’s easy to see why. Biophilic design is proven to boost the physical and emotional health of building occupants and users. In fact, our Human Spaces report showed that those who work in environments that incorporate elements such as greenery and sunlight report a 15% higher level of wellbeing than those who work in spaces devoid of nature. some careful consideration and subtle changes, it’s still possible to make a significant impact. What are the priorities universities need to consider when fitting out a new space? “It may sound obvious, but one of the biggest priorities for universities when undertaking the design and fit-out of a space is clarity about its use – how will the space be used and what does it need to facilitate for users? Knowing the answers to these questions can help to inform the choice of furniture and finishes and ensure it provides the right visual cues as to its intended use. 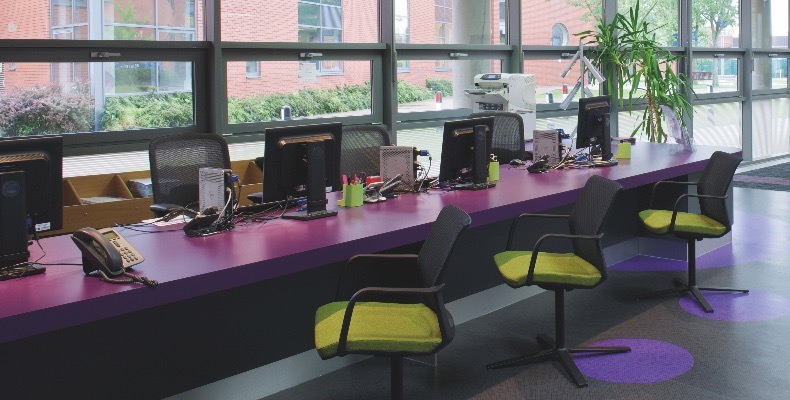 “A lot of our work is in refurbishing tired and out-dated reception, communal hubs, public areas and refreshment spaces that should be acting as important ‘shop-fronts’ for students and parents. Collegiate, creative and modern design can make these spaces more compelling, effective and attractive. “The integration of technology, power and data in furniture and Wi-Fi accessibility are major considerations. Universities increasingly expect a ‘bring your own device’ approach which requires easy connectivity and access to charging. While buildings generally support this, if it is not transferred through the furniture as well, users do not have sensible access at the point of use. Consequently, there is increasing focus on choosing furniture that can house power and data points. “With spaces being used potentially for different types of activity, lighting and acoustics should be considered. A fully controllable LED lighting solution with multiple room settings and feature elements is a must. Similarly, acoustics will play a very important role in the effectiveness of a space. The trend towards exposed services and the industrial look and feel leads to a lack of building fabric with any sound absorbing qualities. The addition of acoustic products and furniture can dramatically enhance a design and provide visual interest in otherwise quite empty spaces. “Flexibility of space is a growing consideration, too. Areas such as lecture theatres, cafés and public spaces are generally larger proportionally and, as such, need to pay back for the space they enjoy by supporting the primary use, as well as meeting secondary needs in evenings or at weekends by other stakeholders. On a recent project, we designed the post-graduate lecture, breakout and refreshment areas so they could be easily reconfigured to provide a lounge with contemporary presentation spaces and areas for catering and networking. By designing flexibility into these environments, which includes giving due consideration to lighting, temperature and acoustic control, it’s possible to derive even greater value from capital expenditure. What major shifts in furnishing the learning environment have you noticed? What has been your latest fit-out? 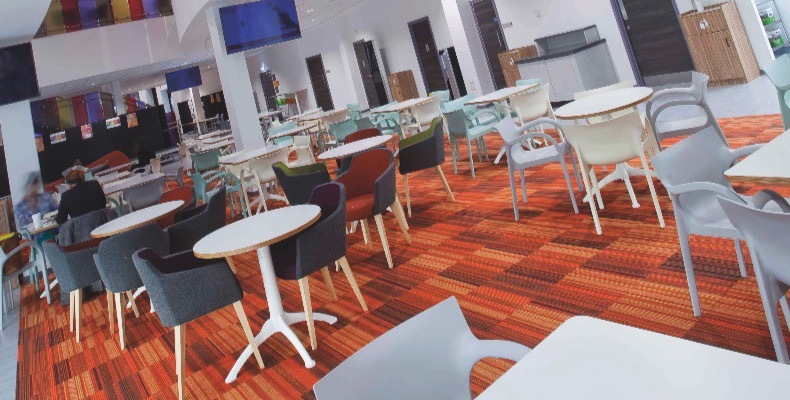 “We have recently completed a £550K furniture installation project for the University of Wolverhampton Business School, which was installed in a 64,500ft2 space over a four-week period. This client embodied many of the trends we’re seeing across the sector, with a requirement for a wide range of furniture options to support different settings and for flexible and durable furniture that would be appropriate for use by students and the wider business community. From street food to local produce, what's being consumed on campus and what are the predicted food trends for 2017?